In water short years, increased attention is paid to how much water is used in the state, where it is used, and for what purposes. Many different numbers are used to describe water use in the state among generalized water users (environmental, agricultural and urban). Often, water use is only described in terms of agricultural and urban uses, ignoring the important dedication of water to environmental uses. The Department of Water Resources’ California Water Plan Update 2013 contains a substantial amount of information regarding water use both in the Sacramento Valley and in the state as a whole. Chapter 3 in Volume 1 describes the many uses of water on a statewide basis and how those uses vary in different water year types (critically dry, dry, below normal, above normal and wet). 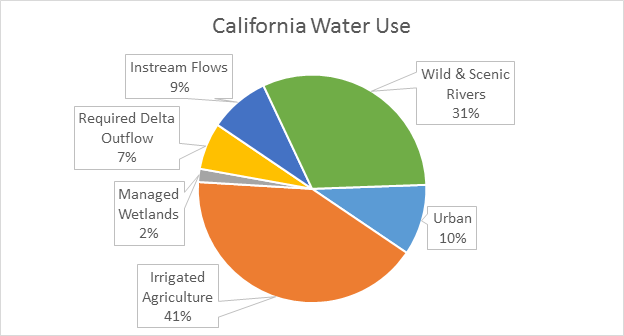 In 2010, “applied water” use (water applied to provide a beneficial use) in California was approximately 79.8 million acre-feet. The “depleted water” use (water that was consumed and not available for other uses) was 58.3 million acre-feet. Volume 2 of the California Water Plan 2013 includes water use information from the hydrologic regions in the state, including the Sacramento River Hydrologic Region. As mentioned above, the California Water Plan has identified 2010 as the year that most closely resembles an average water year in California. The information below is from Water Year 2010 contained in Figure SR14 of the Sacramento River Hydrologic Region chapter of Volume 2. 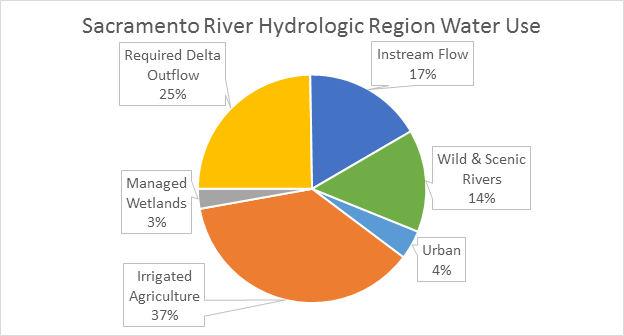 In 2010, “applied water” use (water applied to provide a beneficial use) in the Sacramento River Hydrologic Region was approximately 21.5 million acre-feet. The “depleted water” use (water that was consumed and not available for other uses) was 12.824 million acre-feet. This year, unless there are dramatic increases in rainfall throughout the state, we will experience unprecedented water shortages. Because of this, water uses in the state will differ greatly from what we are used to. That being said, it is important to understand how water is used in the Sacramento Valley and throughout the state and recognize all uses of water to ensure that water management is occurring in a responsible and informed manner. In a water short year this is especially important.